Congratulations! You've said, "I will!" Now, how will you say, "I do"? With style, grace, humor, and all the personality that makes you such a unique couple. Yes, it's a little overwhelming! So many details, so many things to pick; so many decisions to make, and every single one is an expression of your personality. Your NJ wedding officiant should be an easy choice; the choice of someone who will make the very first part of your celebration memorable and different. So how do you pick the perfect wedding officiant? Well, let's see. Do you feel that your ceremony is the centerpiece of your wedding day? Do you hope your ceremony will be personal, creative and inspiring? Do you want an officiant who will be your partner and friend in the planning? Then we should talk! Whether you're getting married next week or next year, our caring, compassionate, creative wedding officiants and ministers (New Jersey doesn't have "Justice of the Peace" options) will make your wedding day more fun than you could ever imagine. We'll include your friends, your family, your favorite music and even your dog! We'll advise you about getting your license. We'll find whatever you need; the perfect park, the cutest little cake, a talented photographer or a romantic harpist. Or we'll just show up, marry you in a short, sweet ceremony and wave goodbye. (We do have a GREAT elopement package!) It is all up to you; it's your day and it should be exactly what you want it to be. Our cool, accomplished, friendly wedding officiants perform weddings for traditional couples and gay couples throughout New Jersey, New York State, New York City, and any tropical location you might dream of! And if we don't travel there, we have polished colleagues who will. We're as happy in a grand historic mansion as we are in your backyard garden, and we'll make sure your ceremony fits your setting. If anyone has told you "you can't"....we'll just say, "of course you can!" Give us a call and let's talk about your ideas. We'll make it all easy for you. Make your wedding completely unique with our creative tips!! Go Ahead...ask us anything! You know you want to! ​What do you want to know? Here are the questions everyone asks! -How long have you been doing this? different experience, but they all share a true enthusiasm for wedding ceremonies! -How are you different from your competition? accomplished, flexible, articulate, quick to respond to your every inquiry, and always professional. We do not, but we do take Paypal, cash, checks, and large bags of small bills. Have a skill? Let's talk barter! -We don't go anywhere without our dog. Can Sparky be our ring bearer? Of course! We are total dog lovers here, and we love dogs in weddings! We can recommend other pros who are too. How could you leave this family member out of the celebration? We can also refer you to local groomer and dog-sitters. You might like our other blog, VowWowWow, all about wedding dogs! -We want to jump the broom/pour sand/have a handfasting/light candles/share wine; can we do that? Sure! This is YOUR ceremony, and it can include anything you'd like. We've had couples share chocolate, braided cords, tequila toasts and even stomp a remote control. (That was a GREAT wedding ceremony!) We'll talk about the things you'd like to include; maybe some you haven't even thought of yet! -This sounds EXACTLY like the kind of unique wedding ceremony we want! We're so glad we found you! What next? We should talk. Or Skype. If you're in the New Jersey area, we could have a cuppa coffee or a glassa wine and talk about your ideas. Many of our couples plan their weddings from far away, and we're happy to video conference through Skype. We'll do whatever is the most comfortable for you, and we work all kinds of weird hours, so no worries there. -We have some questions before we get started; can I email you or call you for more information? Absolutely! Call me! My direct line is 201-563-5544, and my email is Celia.milton@verizon.net We'll talk about your ideas and how your ceremony might unfold. 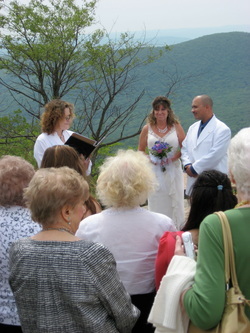 And then you'll chat with one of our fantastic officiants so you can get to know one another. But don't wait too long.....it feels SO good to cross something off "the wedding list". You can email me: Celia.milton@verizon.net, or you can call or text me right now at 201-563-5544. OR you can Skype me at funnyvalentine90. We're easy to find, and I know you'll be glad you did! WHEW!!! Great Ideas for your personalized wedding ceremony! Where are the NJ officiants? West Orange, Wayne, Somerset, North Haledon, Paterson, Jersey City, Newark, Hoboken, Point Pleasant, Spring lake, Basking Ridge, Bernardsville, Glen Ridge, Ridgewood, Paramus, Mahwah, Montville, Sparta, Andover, Sea Bright, Hardyston, West Milford, Ramsey, Ridgewood Ringwood, Bernards Township, Morristown, Morris Plains, Washington Township, Rivervale, Wyckoff, Little Falls, Cedar Grove, Alpine, Weehawken, Edison, and your back yard!